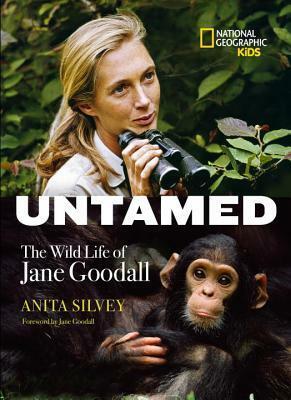 Untamed: The Wild Life of Jane Goodall by Anita Silvey. Grades 4-8. National Geographic Kids, February 2015. 96 pages. Review copy provided by my local library. Jane Goodall was a born scientist. Even as a little kid, she found herself carefully observing and thinking about the world around her. Jane was fascinated by the world of animals and she spent her time watching chickens lay eggs, teaching her dog tricks, and forming a society for animal-lovers at her school, She dreamed of working with and studying animals. After she graduated from school, Jane was given the opportunity to travel to African to stay with a friend who was living there and she worked hard to make it happen. While she was there, Jane met Louis Leakey, a scientist who gave her a job as secretary but had another project in mind for her. Leakey thought Jane would be the perfect person to study chimps. She was hardworking, patient, and willing to brave Africa's dangers in the name of helping the animals. Jane made many important discoveries that we may take for granted today. She was the first to observe chimpanzees using tools, which rocked the scientific world. Previously, scientists had used tool-making as a way to distinguish humans from animals. Throughout her life, Jane made many important discoveries and she worked hard for animal welfare. She got to live the life she dreamed of: a life of adventure dedicated to helping animals. This is a beautiful biography. Jane Goodall's story is an engrossing tale of adventure and animals and this book is perfectly suited for young animal lovers. There is just the right amount of side information provided, which includes facts about animals Jane saw in Africa, little bios of the chimps she observed, and information about people and projects that Jane worked with. The photographs included are amazing. Most are full-color and they show Jane at work in Africa as well as all manner of animals and many of the chimps she worked with. The layout is thoughtfully put together, as well. Anita Silvey describes Jane's manner of observing animals while staying protected in the foliage so she wouldn't intrude on the animals. The book is designed to emphasize that point. Background illustrations of African plants (identified in the beginning of the book) add splashes of color and the feeling of observing from the plants without detracting from the text. The titles and captions are all done in shades of green and brown and yellow, imitating the African landscape as Jane would do in her green and brown clothing. A timeline of Jane's life is laid out as leaves on a vine. It all feels organic and matches the content of the book. Primates: The Fearless Science of Jane Goodall, Dian Fossey, and Birute Galdikas by Jim Ottaviani and Maris Wicks. This graphic novel gives an overview of the works of these female scientists. Both Fossey and Galdikas are mentioned in Untamed, so this book may be of interest. Light Shining Through the Mist: A Photobiography of Dian Fossey by Tom L. Matthews. This is another biography of a female primatologist with stunning photos. Gorilla Doctors: Saving Endangered Great Apes by Pamela S. Turner. Many of the Scientists in the Field series involve scientists working to save animals, and any of them would be good suggestions for young scientists who love animals. In particularly, this title features primates in Africa and may appeal to kids who are interested in the work Jane Goodall has done. Animals Welcome: A Life of Reading, Writing, and Rescue by Peg Kehret. This memoir is another good suggestion for animal lovers. Although Peg Kehret did not traverse the globe to observe animals, she has rescued many and turned her home and property into a wildlife refuge.